In part 1 of this article, we started to look at how a Murabaha share financing structure would work. As a recap, we assumed a scenario where the bank is providing financing to the customer of £1,000, and the customer shall repay £1,050 in one year’s time. The bank will sell shares for £1,050 to the customer (payable in one year’s time), where the bank is acting on the customer’s behalf as the buyer. Clearly, this would apply to the above transaction, and so it is not permitted. So, the bank can not be both the original seller of the shares, and then the final buyer of the same shares. Let us look at the scenario where a party other than the bank is the initial seller of the shares (and the bank remains as the final buyer). The customer is in the financial position that he requires: he receives the financing of £1,000 and repays £1,050 in the future. The bank has certainly disbursed the financing amount to the customer, but is not the party that is due to receive the repayment from the customer. This is not ideal. The bank has delivered £1,000 in return for shares. What can the bank do with the shares? Well, we can say it is now in the position that the customer initially found himself in. It has bought shares and paid money for them. It can either keep the shares (and, presumably, hope to make a profit on this basket of shares) or it can arrange to sell the shares. Our understanding of banks will show that the possibility of keeping the shares is a highly unlikely scenario – banks are in the business of providing loans and (ideally) having them repaid. At the moment, the repayment after one year is being delivered to the third party. This is not a difficult situation to solve – the bank can now sell the shares to the third party, for a price of £1,050 to be paid in one year’s time. It is useful to add the steps here, because they must occur in this order, so that we do not break the prohibition on short selling (or selling what do you not (yet) own). In terms of cash flows, all three parties are in the positions they desire to be in. The customer is receiving the financing, and repaying in the future. The bank is paying out the financing and receiving the repayments in the future. The third party is receiving and paying out the same amount of £1,050, at the same time in the future (after one year). Each party has also purchased and then sold the shares, except for the third party, being the original owner of the shares, and has sold them first, and then re-purchased them back later. What is not ideal here is that the bank is not the direct recipient of the repayment from the customer. In a typical situation, this is an important outcome to secure. If the customer is contractually bound to repay the bank, then any default can be pursued by the bank. In the scenario above, if the customer defaults, it seems that it is the third party that would have the legal right to pursue the repayment, and not the bank. It could be possible for the third party to transfer this legal right to the bank, of course, however it is still not ideal for the bank. The bank would much rather have this right via the relevant sale transaction. This diagram is almost the same as the one above (with the roles of the parties changed) but for one difference – the sale price in step 3 has changed. The reader is encouraged to have a little think about this to see why this is necessary. If you can see why, then feel free to leave a comment below. The key difference now is that the legal obligation for the repayment of the financing is directly from the customer to the bank in one year’s time. This is what the bank desires. For this reason, this version of the structure is more likely in practice. To some people, the above structure may appear to be complete. We can be satisfied with a structuring job well done, and move on. However, in my mind, this gives rise to some important points that we have not yet considered, or addressed. The first question we should ask is – who is this third party that has appeared out of the blue? It is buying shares from someone who it would previously not have known (the customer) and then selling them to the bank. And by buying the shares, it is accepting an obligation to pay the customer £1,000. 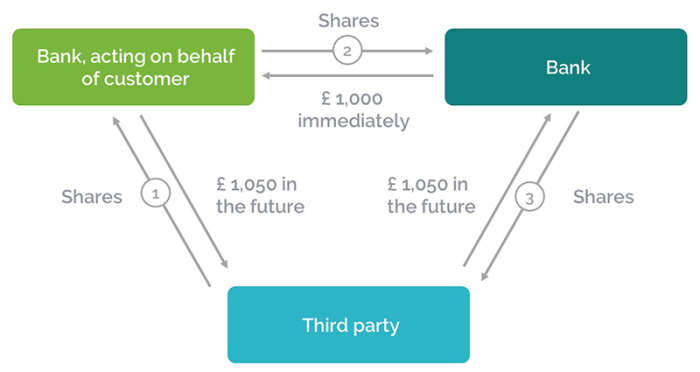 Why would the third party pay £1,000 to purchase shares? What does it intend to do with these shares? Did the third party choose exactly which entities or companies these shares represent? Can it request that the basket only comprise shares in Company X and Company Y, and not in Company Z (because, unfortunately, Company Z is having a hard time of things right now)? If it can not make this choice, then why would it buy a basket of shares that it can not control the composition of? 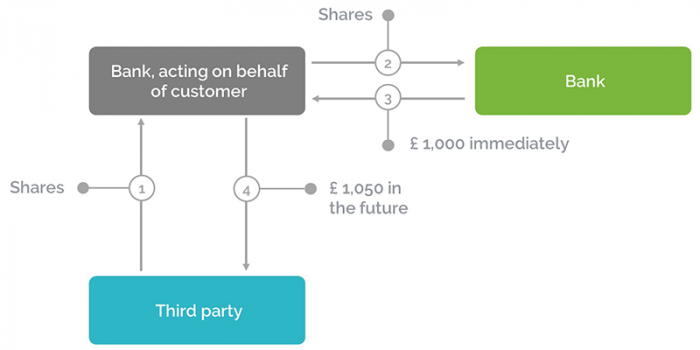 How does the third party know that the bank will purchase the shares in step 3? What happens if the bank does not in fact execute this step? What risk does the third party have here? What if, after executing step 2 (and not yet paying the customer – it would typically have until the end of the business day to deliver an “immediate” payment) – the third party continues to execute step 3 with the bank, receives the £1,000 from the bank, and then refuses to pay the customer? What happens then? After the customer purchases the shares in step 1, what happens if the shares fall in value suddenly and they are now only worth £900. Will the third party still agree to pay £1,000 for them in step 2, which is now £100 more than their current market value? 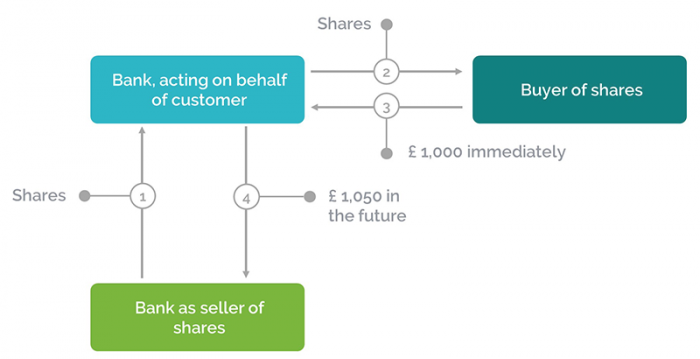 What if, after the third party purchases the shares in step 2, the bank refuses (or is unable) to execute step 3? Is the third party stuck with shares it might not really want to own on a long term basis? What about the presence of any sales tax, or transaction costs, or brokerage fees for transaction on the relevant stock exchange? What if these costs are more than the profit made by the bank here? What if they are large enough to make the transaction no longer attractive for the bank? What does the third party get out of all this – it is buying and selling shares for the same price (and thus making zero trading profit), and in fact accepting some significant risks. What is the incentive for the third party here? There are other questions that arise in my mind, but the above sounds like it is enough to be getting on with for right now. If you have any great ideas on how the above risks can be mitigated, then do please let me know below. We will begin to look at some of these issues in more detail in the next article, insha Allah. And, of course, the mechanisms used to mitigate these risks will be present in many Islamic banking transactions, and not just in loans of £1,000 to retail customers. These are used in transactions worth £1 billion and more.